This military compass contains Anti-Freeze oil and will provide you with accurate-only readings in any temperature! DURABLE BODY: Made from resilient zinc alloy, this survival compass will prevent possible distortions to the fullest! LENSATIC SIDE VIEW & CLINOMETER: Waterproof, & has a lensatic side view with a clinometer for better readings. LUMINOUS DISPLAY : Enjoy now clear viewings thanks to its luminous, glow in the dark display. No more straining your precious eyes! Are you looking for the greatest compass gadget for your boating explorations? Are you sick and tired of cheaply made compasses that aren’t trustworthy? Do you need the ultimate holiday season coming gift for your beloved one? If the answer to any of those questions is yes, then you should keep on reading because we have the finest military compass proposal for you! Do you love hiking with friends, exploring the unknown with your family or traveling off the beaten track? If so, then our military lensatic compass is the way to go. Designed in such a way so as to accommodate all of your daily needs, this compass will become an integral part of your life from this day on! 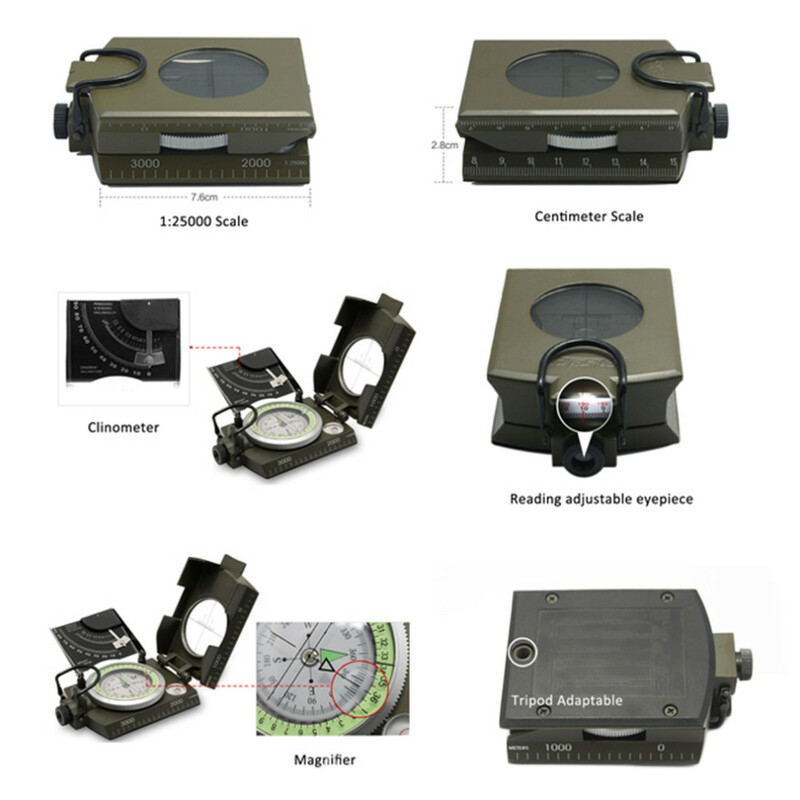 Thanks to its compact design and durable construction, this military compass will help you find your way without distortions. The reinforced hinge with 3/16" bolts instead of a simple hinge, will effectively prevent cover and aim cross from getting loose and fall. This Lensatic Compass Is What You Are Looking For!!! • Premium quality waterproof compass for adults and kids as well. • Accurate reading and bubble level. • Removable clinometer and chart from inclination calculation. • Comfortable thumb ring for convenient carrying. 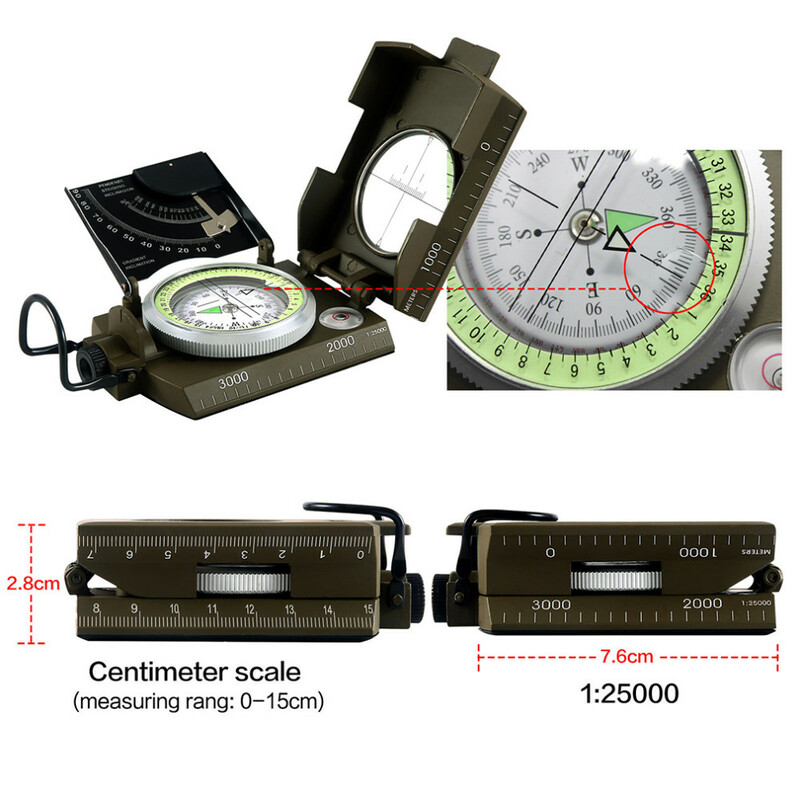 • Survival compass with 1:25000 scale and prism to magnify numbers. • Luminous display, North arrow and 3600 dial for clear readings. • Suitable for finding your position, orienting on a map, hunting, jeep driving, camping and other outdoor activities.